I mentioned earlier in the week that Kilkenny Alive was on the way. Conor O’Neill reckons it’s the future. I reckon it’s a good start, there’s (hopefully) a lot more to come and hopefully too it’s going to stick around. 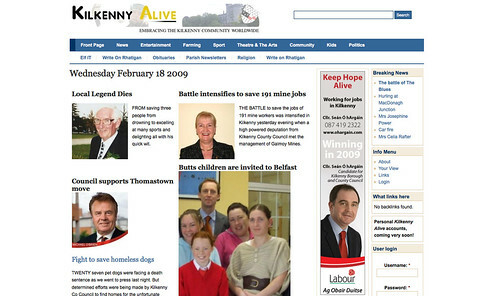 KilkennyAlive.com is the latest addition to the media ranks in Kilkenny. Conor also makes a good point – if your business isn’t online these days, it’s headed for extinction. In terms of delivering a newspaper, this is harsh reality and something that traditional media folk need to get moving on. Despite the ups and down the Voice Group had with the Kilkenny Voice newspaper, I still feel one of the reasons they didn’t succeed is that after three years on the go as a printed publication, there was still no website. For as long as I remember (and I was at the launch of the Kilkenny Voice as well), it was a holding page for some registration company before disappearing completely. A newspaper needs an online presence. Just like a magazine needs one. A radio station needs one. With the demise of the Voice in Kilkenny, we’ve got two printed titles in circuilation – the Kilkenny People (only ABC rated paper) and the Kilkenny Advertiser. Both of these papers are operated by groups. The Kilkenny People, while recently being touted as being up for sale, is under the control of Johnston Press while the Advertiser is part of a larger network (Galway Advertiser, Mayo Advertiser, etc.). Decisions that impact the way these papers operate online have to be fed all the way back up the chain. All the Advertiser sites look the same – sure wouldn’t they have to when you’ve got a brand to promote. The Kilkenny People site, while functional, is lacking. Lacking content, lacking a decent looking design (this being my opinion). With Kilkenny Alive, we’ve got something different. The “newspaper” is the site. They’ll have their journalists, their photographer and they’ve got a strong team behind it all in the forms of Jimmy Rhatigan, Sean Hurley and Mark Brennan. It’s an independent publication that has a strong chance to shape its own future and do something constructive online in terms of news delivery for Kilkenny city and county. Though they’re only up and running to the public since yesterday, there’s some good content on the site. Breaking news will roll as and when it happens (unlike the other papers who are still “edition” based) and it does, with news from yesterday afternoon and the draw for the McCalmont Cup appearing just after lunch today. Yes, Kilkenny Alive is also publishing a Wednesday “edition” but there’s also talk of a free PDF download of the weekly editions, there are currently RSS feeds available for individual categories though you won’t see this from the front page at present. I’m sure there’s plenty more to do for the site in terms of improving visibility, titles, URLs, seeing them indexed in Google News etc but the main thing is, it’s launched, it’s available and I do hope it lasts. Maybe they could take a leaf out of the book of the Munster Express, another solid online resource from an independent publication in the South East.